Take your outdoor entertainment game to new heights with our list of the best trampolines for back gardens – and even one indoor option! Who didn’t want a trampoline in their back garden as a kid? Whether you’re looking to relive your own youth or you’re being nagged into submission by small wannabe bouncers, a trampoline is always a great idea. These won’t be the enormous, high-flying trampolines you see at the Olympics, but something rather smaller and overall more suitable for most garden designs – although if you have the acreage and a spare few thousand to spend, by all means go wild! Frustratingly though, there’s more scope within that bracket than you might think, which can make buying a trampoline a little more difficult than it appears on first glance. 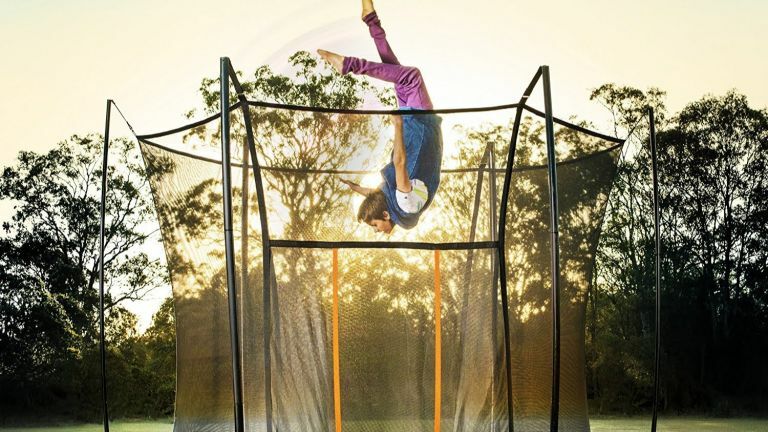 That’s why we’ve rounded up our list of the best trampolines for home use: whether you’ve got little ones or slightly bigger ones who’ve been begging you for a trampoline, or it’s just for you, options abound. The main thing to look out for is size. Our picks range from just over three feet in diameter for an indoor trampet to a huge 14 feet for our most powerful outdoor trampoline, so if you don’t want to end up with a gargantuan bouncer that’ll end up overshadowing your garden, be sure to check our specs before adding to cart. Strange as it might sound, shape can play a part too: circular trampolines are understandably popular, but a rectangular trampoline of the same size will take up less space, as you can push them up against the border for less of an infringement on your lawn. Then, there’s the design. The majority of garden trampolines are elevated on legs, leaving a large gap between the bouncing platform and the ground, but a good alternative for little legs, which can have trouble getting up onto taller platforms, is a dug-in trampoline. While they take a little more work in the first instance, requiring you to dig a little way into the ground before installing, they sit flush to the lawn and can look a lot neater than their high-up cousins, as well as being easier to mount for younger children. And, after all that, there’s the rebounder. If you’re of a certain age, you might recognise these little trampolines from various vigorous workout videos of the 1980s, and there’s a good reason they’re still going strong. If you don’t have a garden but still want to bounce, these mini trampolines, often with handles for extra support during workouts, are very useful if you’re looking for a trampoline for exercise, and if you don't have the luxury of your own home gym, can be stored out of the way when you’re not mid-Jane Fonda. For more buyer's guides and advice about your garden, visit our dedicated garden hub page. This gargantuan trampoline is another that might run the risk of overshadowing smaller gardens, but if you’re after a trampoline with unrivalled bounce-back power, this is it. It’s very large, and admittedly very expensive too, but it looks absolutely fantastic and performs even better. Touted as the world’s strongest recreational trampoline, it’s designed to be extra powerful and extra safe, with concealed leaf springs rather than the traditional coil, a tall enclosure, and no hard frame to hit. While it does necessitate a little bit of landscaping, the real charm of the in-ground trampoline is actually that it helps preserve the look of your garden. If you don’t want to compromise between giving the kids all the bouncing fun their little hearts desire and not wanting an over-large trampoline acting as an eyesore in your beloved outdoor space, then you needn’t. The durable trampoline frame is made from galvanised steel to protect it from rust, and a solid retaining wall keeps dirt from the underside of the trampoline, meaning it’ll stay looking new and feeling sturdy for ages. While all of our trampolines are certified safe for their respective age ranges, this TP Toys trampoline might be a good choice if the whole thing makes you a bit nervous. Its main selling point is peace of mind, with safety features like completely enclosed springs – no danger of landing on exposed bits – an all-round net enclosure – no risk of flying off – and a padded top rail – no banged bonces – ensuring that even with kids’ uncanny knack for getting into scrapes, they’d have to try pretty hard to hurt themselves on this one! Smaller in stature than many of our other picks, and in a cheerful blue and green colourway that makes it look altogether friendlier, the Junior Jumper by Plum is our best trampoline for younger children. The lower frame height makes it easier for those with little legs to get up and down, and the reduced distance from the ground mean that any accidental falls while trying to mount are more likely to be shrug-worthy than startling. It’s also a great combo of sturdy and comfortable, with a frame made of galvanised steel for strength and rust-resistance and thick foam pads to prevent knocks. This more traditional-looking rectangular trampoline is most similar to what you’d find at the local rec, and while it gives you loads of room to bounce around in, it also saves more space than a circular trampoline. It’s built to withstand some reasonably rough treatment too, since it features ultra bounce heavy duty galvanized springs for bursting strength and maximum bouncing, with 4 sturdy W shaped legs using 8 curved poles. For its space-saving design that doesn’t compromise on freedom to jump, and a durable construction, this is possibly our most practical trampoline for back gardens. Awesome design, budget price – what’s not to love? This cool-looking orange and black trampoline certainly stands out from the chiefly grey and black crowd, but its real selling point is its budget price. It can be hard to justify spending lots on a trampoline for the back garden if you’re not sure they’re going to keep playing on it, so it’s gratifying to know that there are inexpensive, safe and sturdy options like this Sportspower trampoline. The ‘Quad Lok’ steel galvanised frame is reportedly easy to put up and take down and stands up to bad weather, while the enclosure folds away quickly for speedy storage. Plus, super strong springs promise ‘amazing bounce’ – after all, isn’t that what it’s all about? This rebounder set is a whole workout setup in itself, featuring an indoor trampoline, sand weights, resistance bands and a compilation DVD to inspire your routines. If you’re looking for a trampoline for exercise, we recommend thinking outside the box and going for one of these rather than a full-sized outdoor version. This MaXimus model comes highly recommended from happy reviewers saying that the foldaway design is genius, the rubber feet and springy platform are sturdy, and the support handle keeps them secure and comfortable during a vigorous workout. By all reports, it’s a great all-rounder.